On June 4 more than 100 tents went up around the state Capitol in Madison. The spirit of resistance is alive across the state of Wisconsin. From the first eruption of struggle here in February, when Gov. Scott Walker introduced a union-busting bill, and as attacks on working and oppressed people have broadened and sharpened, youth and students have played a decisive role, helping to advance and build the fightback. Young people were the backbone of the historic three-week occupation of the Wisconsin State Capitol Building in Madison in February and March. They’ve led mass walkouts at high schools and universities in solidarity with their teachers and other workers under attack. And they held down a 67-day occupation at the University of Wisconsin-Milwaukee — the longest such occupation in U.S. history. At each stage of the struggle, young people have led these actions in principled solidarity with workers and oppressed peoples. This solidarity has helped the struggle here mature to the current level. In the last week alone, young people have helped to lead bold and militant initiatives, including building a “Walkerville” tent city occupation in Madison. This has opened up phase two in the expanding fightback against union busting, austerity and the myriad attacks being directed at workers and oppressed people. On June 6 the Fire Fighters union, National Nurses United, American Federation of State, County and Municipal Employees, and farmers, students and community organizations held a demonstration in Madison of several thousand people against the budget, the union-busting bill and austerity. With the firefighters in the lead, the march stepped off from Fire Station 1, several blocks from the Capitol. After marching through streets around the Capitol, the demonstration stopped in front of M&I Bank. With chants of “Banks got bailed out, we got sold out,” several dozen demonstrators, mostly young people, entered the bank lobby. After a 15-minute standoff with the police, they were ejected, but the bank had been successfully shut down and the blame for the crisis was placed squarely where it belongs — on the banks. 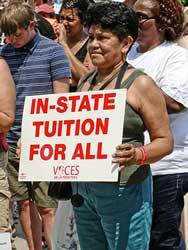 On June 2 the Joint Finance Committee of the Wisconsin legislature was scheduled to discuss deep cuts to education, including a repeal of in-state tuition for undocumented students. Just two years ago in-state tuition for undocumented students was won in the state, after years of struggle led by Voces de la Frontera, a major immigrant rights group in Wisconsin. More than 50 high school students from the Milwaukee and Racine areas who are with the youth arm of Voces, YES! (Youth Empowered in the Struggle), packed the meeting shortly before it was scheduled to begin. They were dressed in graduation gowns with signs around their necks that read “What’s Next?” More than 50 other students and community members turned out for the meeting. While the meeting was scheduled to begin at 1 p.m., the committee didn’t begin the session until six hours later, around 7 p.m. It was clear this tactic was meant to wait out the immigrant rights activists and supporters, in hopes they would become frustrated and leave. The tactic failed. Once the meeting started, Voces Executive Director Christine Neumann-Ortiz, former UW Regent and immigrant rights activist Jesus Salas, Milwaukee Public School Board Director Larry Miller, and Racine Education Association union member and high school teacher Al Levie stood up and began reading a statement condemning the committee for attempting to eliminate in-state tuition for undocumented students and impose deep cuts on public education. They were all carried out of the meeting by state police and other cops. For the next hour, various people, young and older, stood up and began reading from the statement, effectively shutting the meeting down. Young people in the crowd also led chants that rocked the room. More than 30 people were hauled out of the meeting, including Lee Abbott, past co-president of the Milwaukee Graduate Assistants Association-American Federation of Teachers at UW-Milwaukee. The following day, when the committee met again, Voces packed the meeting and organized another disruption. Similar numbers of people were removed from that meeting. 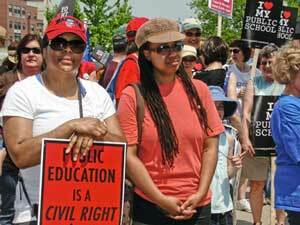 Mass march demands: Hands off public education! On June 4 a coalition of organizations, including Voces, YES!, Metropolitan Interfaith Council on Affordable Housing, Milwaukee Teachers Education Association, NAACP and many others, led a spirited, multinational march in Milwaukee against proposed $1.6 billion cuts to K-12 pubic education in Walker’s 2011-13 budget proposal. Walker is also proposing another $250 million cut to the UW system and the deepest cuts ever for the Wisconsin technical college system. The crowd marched from Milwaukee’s North Side through the South Side, both predominately Black and Latino/a areas. Students, unionists, teachers and community members participated in the demonstration, which drew several thousand people into the streets. Denis Montero, a student at Milwaukee Area Technical College and an organizer with YES!, helped lead the youth contingent, which included members of FIST and UWM Occupied. The contingent’s energy and militancy were high. The June 4 march was led by Vel Phillips and others who participated in 1967-era battles for open housing. Phillips was the first Black woman to graduate from the UW-Madison law school, the first woman judge in Milwaukee, the first African-American judge in Wisconsin, and the first woman and first person of color elected Secretary of State in Wisconsin. Many organizers drew the powerful connection between the Civil Rights and Black Freedom struggles in the 1960s with the struggle against the attacks being waged on working class and oppressed communities today. The march crossed the 16th Street Bridge, a site of historic civil rights marches, on a street that was recently renamed after farmworker organizer Cesar Chavez. On June 4 more than 100 tents went up around the state Capitol. The AFSCME, Service Employees union, Teaching Assistants Association-AFT at UW-Madison, Wisconsin AFL-CIO, UWM Occupied, Bail Out the People Movement, Wisconsin Resists, Wisconsin Wave, Workers World Party and many others pitched tents, visited the encampment, dropped off supplies and/or distributed their literature. Many unaffiliated young people and community members joined the occupation. Organizers plan to maintain a 24-hour presence at the state Capitol, using the tent city as a staging ground for actions and rallies to intervene as the draconian, racist, sexist budget makes its way through the legislature. Demonstrations are planned for every day around a different aspect of the public sector. 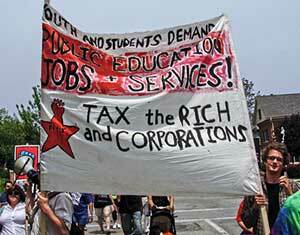 For instance, on June 5 the Madison K-12 teachers’ union staged a rally of several hundred teachers against the cuts. On the weekend of June 10-12 union members and students from UW-Milwaukee will board at least one bus and camp out for the weekend. Various organizations have discussed the possibility of broadening the tent city beyond Madison and erecting encampments in Milwaukee and other cities around the state. 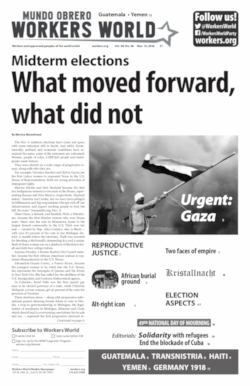 However the struggle develops over the next few weeks, the occupation itself is a significant and important step forward, demonstrating the fierce spirit of struggle and the righteous indignation at the system that is bubbling across the state. For more information, visit www.wisaflcio.org; wisaflcio.typepad.com; www.vdlf.org; www.defendwisconsin.org; and www.bailoutpeople.org. Ben Carroll, a member of FIST and Workers World Party from North Carolina, is in Wisconsin participating in the people’s rebellion.